Spring is one of my favourite seasons and a beautiful time of year. The flowers are blooming, the days are getting lighter and the weather is getting warmer. It's a season that inspires many of us to think about new beginnings, fresh starts and generally have a brighter outlook on things. 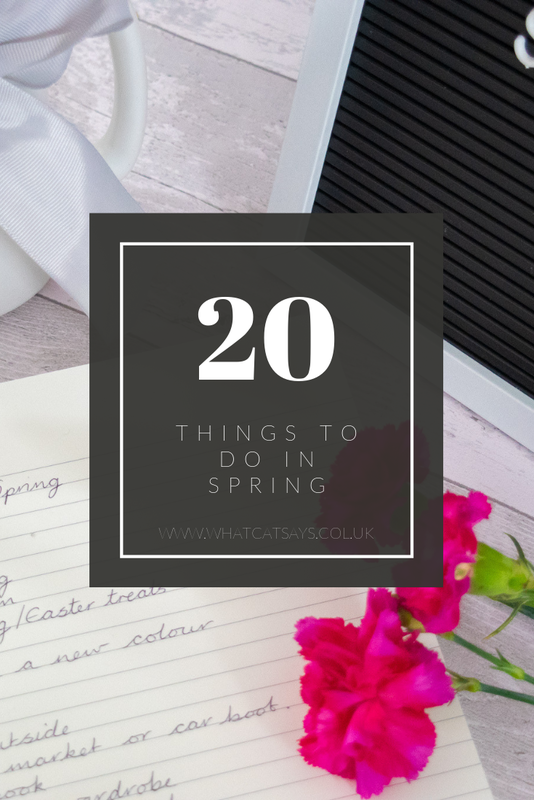 I usually feel more motivated around this time of year too which has inspired me to create this list today of twenty things you could do this spring or every spring for that matter. I hope it inspires you to do something new, different or refreshing this wonderful springtime. Have a spring clean. This is a classic thing to do around springtime and actually quite therapeutic as I learnt most recently. 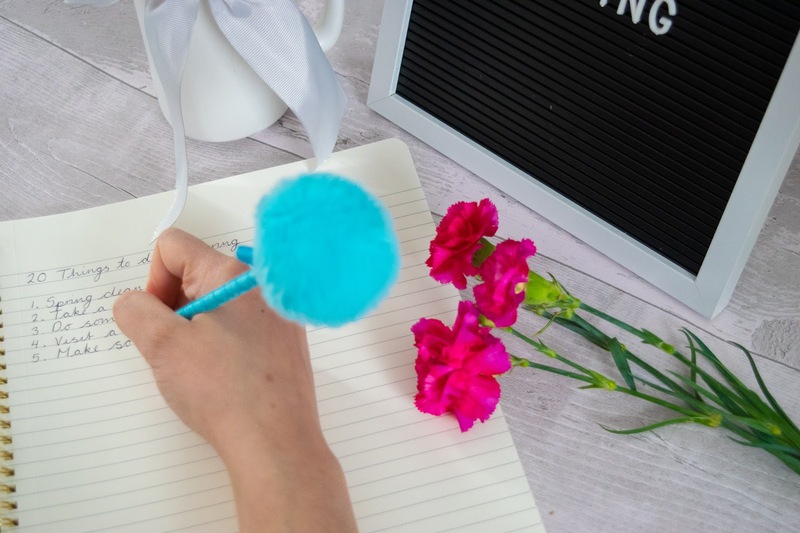 Having a spring clean gives you an opportunity to clear our things, reorganise and make everything super clean. I cleaned my house the other day top to bottom and it felt amazing once I was finished. Not only did every room smell really fresh, but it felt brighter and more relaxed. Take a day trip. Take a day trip anywhere. Cross the water or borders to a new country, county or state and just go somewhere you've never been before - just for a day. It's such a fun thing to do and especially when the weather warms up. I like to visit new counties. I have a map with all the counties I've been to scratched out. One day I want to say I've been to them all. Do some gardening. I have just discovered the stress-free, relaxing and therapeutic art of gardening and I love it. I have a new found sense of pride for what I plant outside and I really love being in touch with the outdoors. It's so nice to be outside, making something beautiful that is also good for the environment. There's an article explaining why gardening is actually good for you that you should read if you need any more convincing on why you should be gardening this season. Visit a local farm. It's a great season to be thinking about visiting your local farms to see the newborns and other farm animals. I love visiting farms and it's a nice thing to go and do this time of year. Some visitor farms also sell their local produce so you could go and purchase something to support them too. Make some Spring/Easter treats. There are so many spring and Easter inspired treats and I love making something new when I can. This year I've been scrolling through Pinterest to find some favourites to make when friends come over and to take to family events like our annual Easter get-togethers. Whether you're trying the classic chocolate nests or making a bunny cake. Baking is fun and colourful in the spring. Go to the beach. One of my favourite things to do when it gets warmer is to go to the beach. It's my favourite place in the whole world and I love it when all the businesses open up for the first days of Spring. Everything is fresh, new and the sea is beautiful on those warmer days. Paint your nails a new colour. During springtime, I am almost always more inspired to try new nail colours. I often spend a lot of time painting darker and bolder colours around Winter, but when Spring hits I like to get out all the pastels, neons, topcoat and get creative. I'm currently sporting pearlescent lilac nails from the Barry M Silk collection called Heather and I'm going to move onto the pink one from the collection called Blossom next. Have a BBQ. I always wonder when the first barbecue is going to happen and I love a warm Sunday for that. It's a sure sign of spring when you can smell barbecues on the go. Get crafty. Think about making something! Whether you're upcycling a t-shirt, sewing on patches onto a bag or making something to hang on a wall. Get on Pinterest and get inspired to make something. Have a walk outside. Another classic thing to do but also a very good one. There are so many places you could go: the local park, down the road, to the shops. Take some time to appreciate the weather and the flowers in bloom. Go to the local market or car boot. Most people's local market is the one down their high street but the ones I'm talking about are the ones that pop-up seasonally, antiques, car boots or even the farmer's markets. I love going to visit these and think they're amazing opportunities to support local businesses and find a bargain. Read a new book. I've challenged myself to read two particular book series that have been on my reading list for ages but on top of that, I've bought a new book that I'm really keen on reading. It's always good to get a fresh new book to read and maybe even sit outside to enjoy it along with the wonderful weather. Freshen up your wardrobe. And by this I mean buy some new additions to it! I think spring is a fantastic opportunity to freshen up your wardrobe with new pieces fitting for the season. I've already started to make some additions that I'm excited to share soon as my wardrobe just seems to be a sea of jumpers and nothing else. It needs a good update! Check on your year's goals. One thing I think we all need to be doing on a regular basis is to check in on our resolutions. Every year I set myself some goals and I usually do a bi-annual check on them but I think it's important to check on them more regularly to motivate ourselves to continue with them rather than give up halfway. What have you achieved so far this year? Catch up with friends. I love a good catch up with friends especially if I haven't seen them in a while. How about this spring you make a conscious effort to catch up with some and see a little more of those you don't see as often. Learn a new recipe. I love learning new recipes and I like finding ones that are fitting to the season. I have some great autumn/winter comfort food recipes but I'm now looking to find some good spring inspired ones. I'll be scrolling through Pinterest for them this season. Upcycle some furniture. On my to-do list is to update a shabby dining set we have. I'm really excited to get to it and freshen it up for spring. With the warmer and drier weather, it means I can go outside and do this without the worry of making a mess inside. Go to the local pub. All pubs are lovely to go to in the spring when the gardens are open. Imagine having a fruity glass of cider in the warm sun with friends. Perfect. Clear out your wardrobe. As well as freshening up your wardrobe with new pieces another thing you could do is go all Konmari and clear our some pieces in your wardrobe that no longer bring you joy. I try and do this as regularly as I can and I always feel so good for having a clear out. Take up a new hobby. 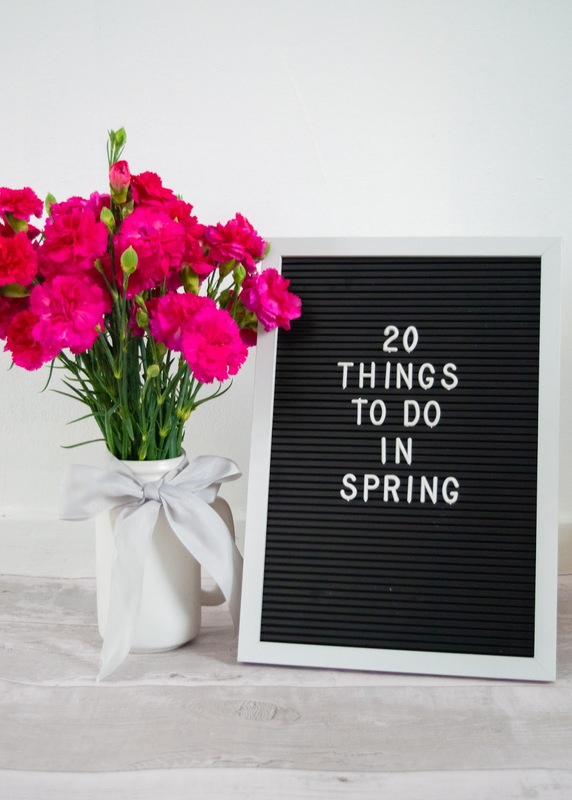 Spring is a fab time to think about starting up a new hobby or even just trying something new whether it is taking up a sport or learning a new skill. I want to learn the skill of wood burning and have already started to. I'm really enjoying it and already planning a couple of future projects where I can continue to practise and learn how to wood burn to perfection! That's so cool! I bought flowers from the garden centres near my house and have a gorgeous front garden now. Now my job is to keep them blooming!